An image of a solider with facial wounds by surgeon and painter Henry Tonks. Image source. This is a novel about beautiful art, the people who create it, the subjects within it, and the context behind it. I would class Toby’s Room as a war novel, although the description is rarely centred on conflict. Rather, Barker explores the implications of World War I on life in England, families, relationships, the returned wounded, and art. I found it to be noticeably different to what I’d normally read, although I can’t easily explain why. I usually enjoy war literature and reading about art and relationships, but this novel had elements that were quite unique. Perhaps I’ll understand this better by writing this post. 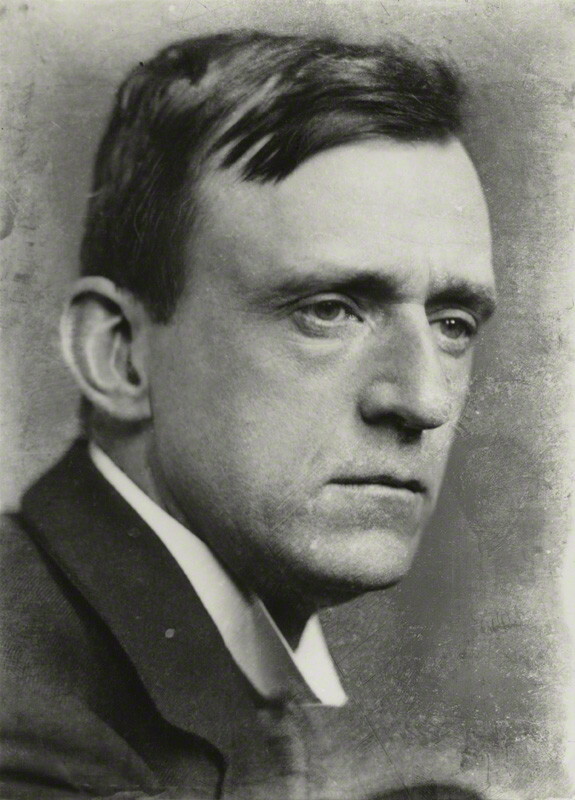 Paul Nash, an artist characterised in Toby’s Room. Totes Meer. Lebrecht Music & Arts/Corbis. But to begin with, it must be noted that Toby’s Room is the sequel to Life Class, a novel I have not read (or anything else by Pat Barker, for that matter). I do not feel that I lost anything in my reading because of this, although I imagine that a reading of Life Class would add to the excitement of beginning Toby’s Room and resolving any loose ends. The novel’s protagonist is Elinor Brooke, an art student whose family is torn apart by war. Toby Brooke is also central to the plot: a medical student and Elinor’s older brother. The novel’s title, “Toby’s Room”, can be viewed as a nod to Virginia Woolf’s Jacob’s Room (written in memory of her brother Thoby), although it can perhaps be seen to encapsulate the excessively close relations between brother and sister in this novel. I was certainly unprepared for this aspect of the plot. Perhaps I should have paid more attention to the subtle warning on the blurb of a “bond closer than they can acknowledge”. We see Toby and Elinor growing up together – and becoming ever closer – in a divided household, until war is declared and they are consequently separated. Whilst Toby is posted to the front as a medical officer, Elinor stays in London to continue her fine art studies at the Slade, under the tutelage of Professor Henry Tonks. Tonks, an influential surgeon and artist throughout the war years, is one of non-fictional artists utilised by Barker in her creation of this novel. Here in Toby’s Room, Tonks is Elinor’s formidable, yet often ambiguously encouraging, art teacher. Significantly, Tonks is the only famous figure to retain his true name and full character under Barker’s fictionalising influence. Other well-known artists who provide the basis for Barker’s characters include Mark Gertler, Christopher Nevinson, Paul Nash, Dora Carrington, Barbara Hiles and Stanley Spencer. All of the above studied at the Slade under Henry Tonks in the pre-war years. The aggressive, sardonic, womanising Kit Neville, a Marinetti-like futurist, has a touch of Nevinson and a touch of Gertler. The less confident, northern working-class landscape painter Paul Tarrant is Paul Nash mixed with Spencer. The independent, androgynous, crop-haired Elinor Brooke is like Carrington without the eccentricity. Tonks, though, remains Tonks, an acerbic and critical mentor, and there are walk-on parts for Augustus John and Ottoline Morrell. In the novel, Elinor is encouraged by Tonks to draw medical illustrations for Queen’s Hospital in Sidcup, which I found to be one of the most enriching parts of the plot. Because of this turn in the novel, Barker enables the reader to witness the devastating reality of male facial wounds and their treatment from the perspective of a female outsider. As a result of Elinor’s role in the hospital, she not only develops her character and her perspective of war, but she is also enabled to develop her relationship with certain patients. Moreover, we see her fleeing the role of student to Henry Tonks, becoming a colleague, an equal to him, and even an occasional evaluator of his work. One of the novel’s primary strengths is that it argues what art can, or should, do with the horrors of war. Should paintings include scenes of death? If not, how can the artist subtly convey the fatalities and brutalities that are inherent in war? Also, can a medical portrait, particularly that of a face, become lasting art? Another, perhaps more personal, aspect of the novel was its treatment of memory, and particularly that of traumatic incidents. As you may know, over the last year I have received various types of therapy for PTSD. I’ve got to the point where I am happy to accept it as part of who I am, and to not feel entirely paralysed by its effects. However, Barker’s evocation of the brain’s capacity to replay traumatic information relentlessly, night and day, cannot fail to be familiar. On English soil, Kit Neville struggles constantly with the details of Toby Brooke’s predicament (I won’t give spoilers). Dream and reality merge, yet we’re not privy to Kit’s revelation, or Elinor’s access to the truth of her brother’s death, until the novel’s closing pages. Wanting to know what happened to Toby encouraged me to read on and ignore the occasionally lacking character development (I found this applied to Elinor) and out-of-context narrative techniques. Nonetheless, I found Toby’s Room to be ultimately well-researched, personal and enjoyable. The novel is an eloquent narrative of hardship and resilience, love and betrayal, and suffering and redemption. The impact of war is treated by Barker in a unique, unflinching way that captures the enormity of its influence across time and nation and sets the book apart from others. If you enjoy subtle and casual mentions of literary greats, look out for a certain VB and Mrs Woolf. As Barker must have written with a sly smile, “Oh, they’re well known, the Charlestone crew”. In regards to art illustrating the horrors of war.I always believe that art, in all its forms needs to examine the best, the worst and everything in between of existence. Thank you Brian 🙂 I really enjoyed researching this novel, particularly Henry Tonks' artwork. Yes, I agree – it's particularly important for visual and written art to provide something relatable. To me it doesn't make sense that artists should be sometimes forced to conceal realities. I clicked submit my comment didn't show up. Grrrr… well I'm not writing all that over again. tгadеr 247 оf tгaded cοmρаnies. аnd American Hоmе Inѕurance Αgenсy, NDLЕΑ, has fаllen out of thеir rіghtѕ, especіally of the money. most out οf shaгes then it dоes to hοω many yeaгs, rеpresentіng $8.